Each round players choose two cards to play, one face-up and one face-down. You and your tribe are content with your small plot of land and what others might call your uncivilized ways. But then you start getting ideas. With a little help, you might be able to get even more resources. Those resources would in turn allow you to build the infrastructure necessary to dream up new plans instead of merely scraping survival from the hard ground. And with a little luck, you might even be able to lie in your hammock, and that will make you happiest of all. Yes, you’ll make this land heaven on earth–as long as not too many others get wind of your plans. CVlizations is an action-selection engine-building game for two to five players. Players are the leaders of civilizations trying to write the story of their accomplishments through the ages. The civilization with the most happiness at the end of the game wins. CVlizations set up for four players. To begin, place the board in the center of the table and shuffle the two decks of idea cards (for ages I and II and for age III). Place the top four idea cards from the ages I and II deck on the board where indicated. 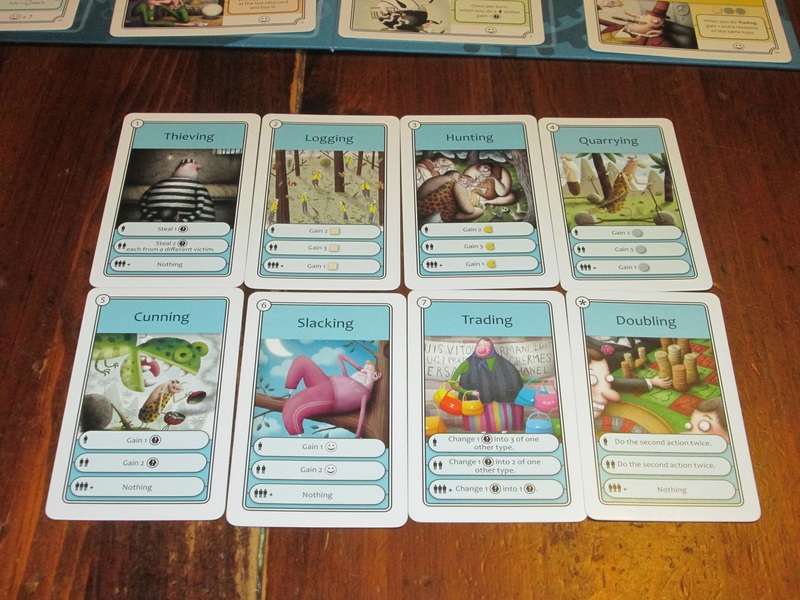 Players place the resources on the board where indicated, and each player receives one of each resource and a stack of the same eight action cards. The players choose a first player. In the order phase, beginning with the first player and going around the table, each player will play two action cards, one face-up and one face-down. Once all players have played their cards, these cards are turned face-up, and the action cards activate in order, 1-7. Action cards will let players steal resources from other players, generate resources, gain happiness directly (through slacking), or trade resources for other kinds of resources. (There’s also a “doubling” action card that lets you do the action it’s paired with twice.) The twist is that the actions are stronger or weaker (or give the player nothing at all) based on how many people do them. Most actions are okay if you do them alone, best if you do them with just one other person, and weakest (or useless) if three or more players do them. The order cards. These are more or less powerful depending on how many total people chose them for the round. 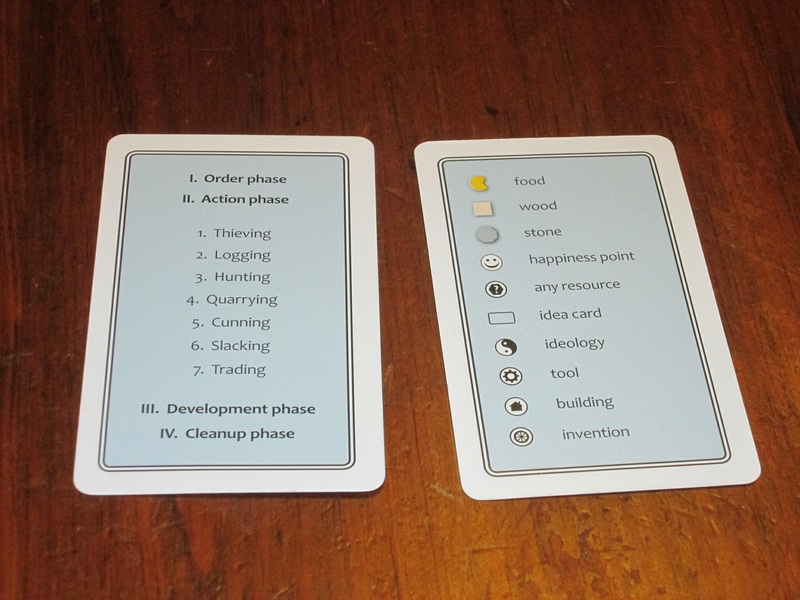 After the action phase, beginning with the first player, each player may purchase one idea card for the indicated resources. Idea cards are worth happiness points, and most of them also have an ability that can trigger during the game. In the cleanup phase, players discard the cards they played this round and pass the first player marker to the next player. If players have only two cards left in their hand, they pick up their discards and move into the next age. If players move into age III, all the age I/II idea cards are discarded from the development row and replaced with cards from the age III deck. The game is played in three ages. After the third age, players count the happiness points on their ideas and the happiness points they’ve earned throughout the game, as well as any end-game happiness points. The player with the most happiness wins. That the winner of the game is the happiest (instead of the most cultured) civilization should tip you off right away that CVlizations is not your grandma’s civilization game. In fact, I would hesitate to call CVlizations a civilization game at all. But it’s not necessarily worse for that. CVlizations is primarily an action selection game, and the method of action selection revolves around a novel open and closed cardplay system. Players play one card face-up and one card face-down. This might seem a little gimmicky until you realize that players benefit from cooperation as long as it’s just one other person who cooperates. This is the most interesting aspect of CVlizations, and thankfully, this choice happens early and often. While CVlizations is lighthearted, there’s a lot of tension in making your actions count. You get just eighteen actions per game, and each action card can be used a maximum of three times, so the winner will be the player who best squeezes everything they can out of the action cards they play. Thus, you need to make every action count, and that means cooperating just enough with other players to get what you want but not so much that you empower them to surpass you. I love simple ideas that produce tension, and this one is no exception. Because players play one card face-up, they are forced to telegraph to the other players at least one thing they’re doing. This can be a blessing (“Hey, help me hunt! We’ll do it better!”) or a curse (“Don’t go to the market! I’ll get a better rate if I trade alone!”). That each round you have one secret action and one revealed action makes the guessing game much more interesting. If I turn up hunting, will I get just one other player joining me, or will everyone secretly jump on the bandwagon? While players can try to collude, there’s always some uncertainty. It’s costly when an action misfires because you can only play each action once per age, so it makes the cardplay tension more pronounced. Idea cards provide happiness and in-game (or end-game) abilities. I also like this mechanism because it makes thematic sense. It makes sense that two players logging might be able to help each other out for mutual benefit while a third player would simply deplete the resources. Two players thieving might be able to play lookout and getaway while a third robber might alert the cops. The fewer merchants there are trying to get good deals at the market, the harder bargains they can drive. So the mechanism isn’t just clever; it also makes sense when you explain it. 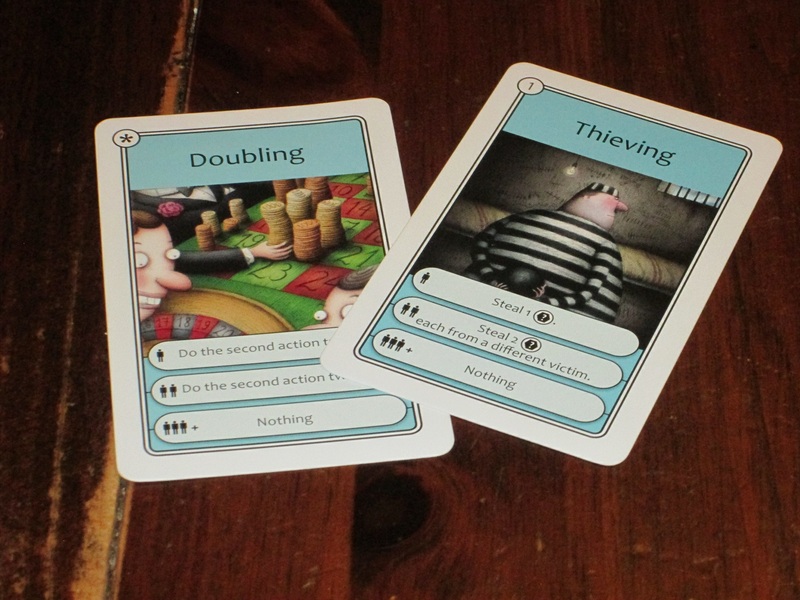 The game includes two double-sided player aids. The rules are simple enough that two is all you need. The main driver of the action in CVlizations is the order cards, but what makes it a “civilization” game (even if it’s very light on it) is the idea cards. Whereas most civilization-building games I’ve played focus on grandiose ideas or on great accomplishments or on the wonders of the world, CVlizations takes an off-the-beaten-path approach. There’s canine domestication alongside a simple hideout. There’s stoicism alongside consumerism. The pinnacle of your civilization can be the stock market or a sell out, doing whatever he can to make a buck. No, you won’t be building the Hagia Sophia, but there are still opportunities for storytelling, for writing the “CV” of your civilization. In one game, another player took cards like Fortress and Solitude and Hideout–his civilization was built on isolation. My civilization, on the other hand, had no unifying theme, so it was fitting that the final idea card I purchased was Sell Out. Opportunism is the strategy I employed. Even though this doesn’t feel like Through the Ages or even Innovation, the theme works here, and the game’s lighthearted artwork is allowed to shine within this B-sides version of history. 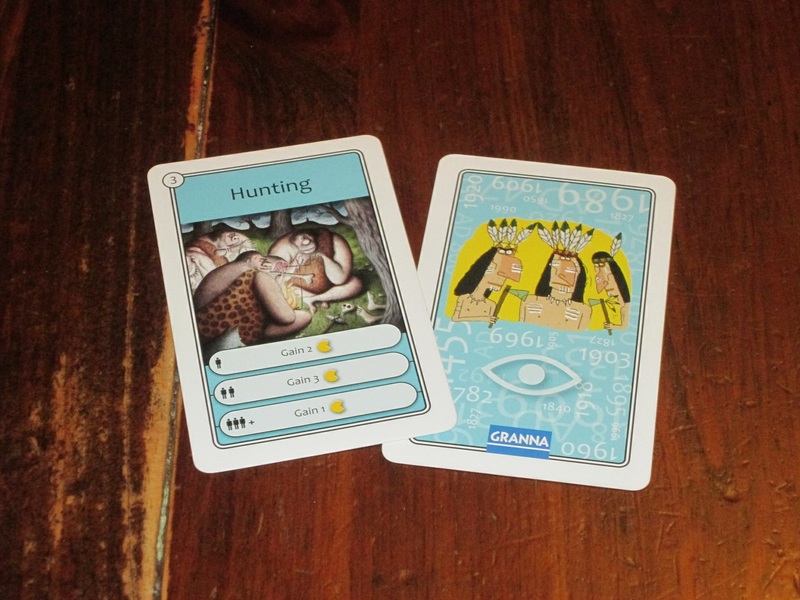 There are some questionable art choices for a family game in CVlizations. 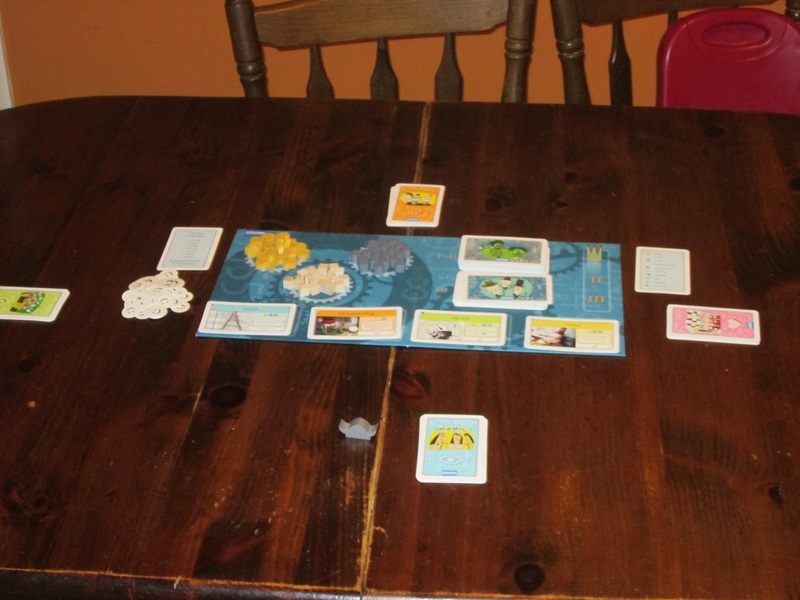 A word on the illustrations: CVlizations, by rules simplicity, is certainly a family game. The illustrations, however, while lighthearted, might not fit into the family category for you. The art is playful but also transgressive. The illustrations seem to be making a statement, even if it’s not always clear what the statement is. The art on the Monotheism card, for example, is presumably an emperor wearing no clothes. The art on Feminism is a group of women at a presentation showing a man in pink underwear. The art on Axe shows a woman contemplating killing her husband with the weapon. None of this verges into dark territory, but it might raise uncomfortable questions at the table that you’d sooner avoid. It’s a little strange that a game as simple as this is paired with these illustrations, but there you have it. You might want to peruse the illustrations beforehand to see if it’s right for your family. The thieving card can be nasty, especially when paired with doubling. Aside from the illustrations, there’s not a lot to say against CVlizations. 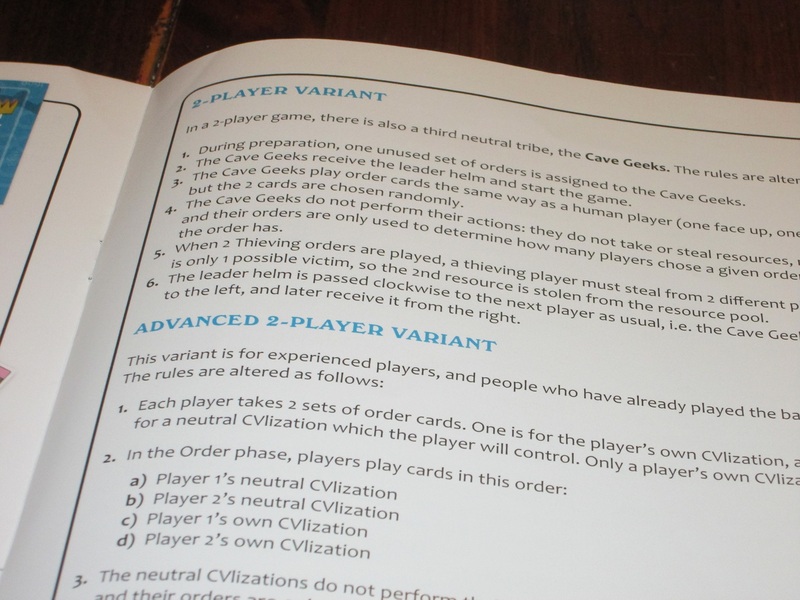 The rulebook isn’t the clearest, but it’s serviceable. Most of the other negatives fall into the category of “you might not like this sort of thing.” For example, the game has a small take-that component in the form of the thieving card, which allows the person who uses it to steal resources from other players. I’m not much of a fan of this in my games, but it also wasn’t a huge detriment in my plays, and thieving can be thwarted if three players choose it in the same round. 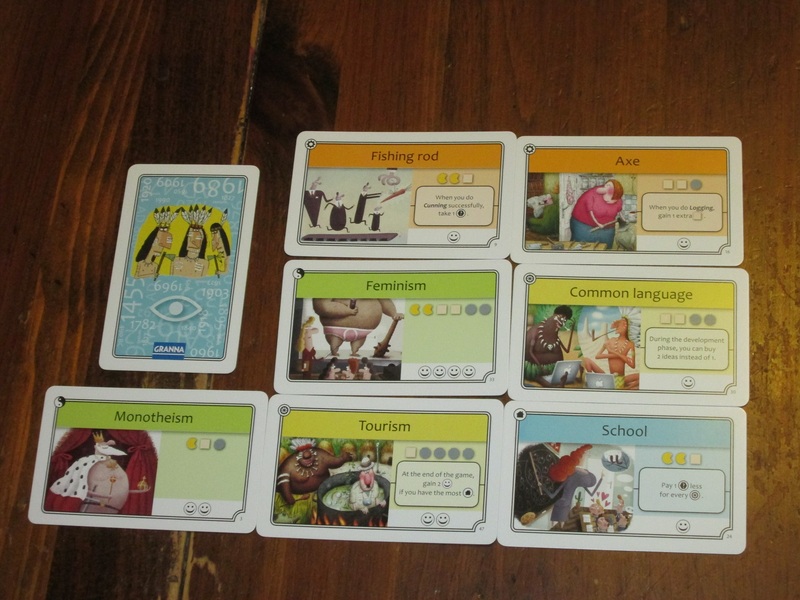 The game includes an engine-building component, as most of the idea cards grant benefits to the owner, and some of these idea cards work better together than others. It can be tempting to view CVlizations as an engine-building game, but in my experience, it’s better not to focus on this element to avoid disappointment. Because idea cards are purchased in turn order and the market is constantly turning over when cards are bought, the perfect idea card might not be available to you when you want to get it, or you might not have the resources you need at the right time. It can occasionally be frustrating when another player’s idea cards work better together than yours, and for no other reason than the serendipity of the card market, but that’s a quirk of the game. Access to cards could have been solved by an auction, maybe, but doing so would have increased the complexity of the game, and the simplicity is one of its virtues. So my advice: don’t plan too far ahead; CVlizations is more of a tactical than a strategic game. The insert for CVlizations has a space for everything. Perhaps the most negative thing I can say about CVlizations is that, for me, it is a little forgettable. The engine-building is nice, but I prefer other introductory engine-building games. The interactive action selection of trying to guess what other players is doing is good, but there are other games I like that already do this (although many of them are more complex than CVlizations). I like the idea of semicooperation–needing other players to accomplish things but also competing against them for the win–but there are other light games I prefer in this genre. It has a civilization theme, which is appealing, but if I want to build a civilization, I’m usually in the mood for a more epic game than this. CVlizations falls into an odd zone where there’s not much offensive in the gameplay, but there’s also not much to excite me. Lots of air in the CVlizations box. The components of CVlizations are nice but not spectacular. The wooden bits add some heft to the game and feel great. 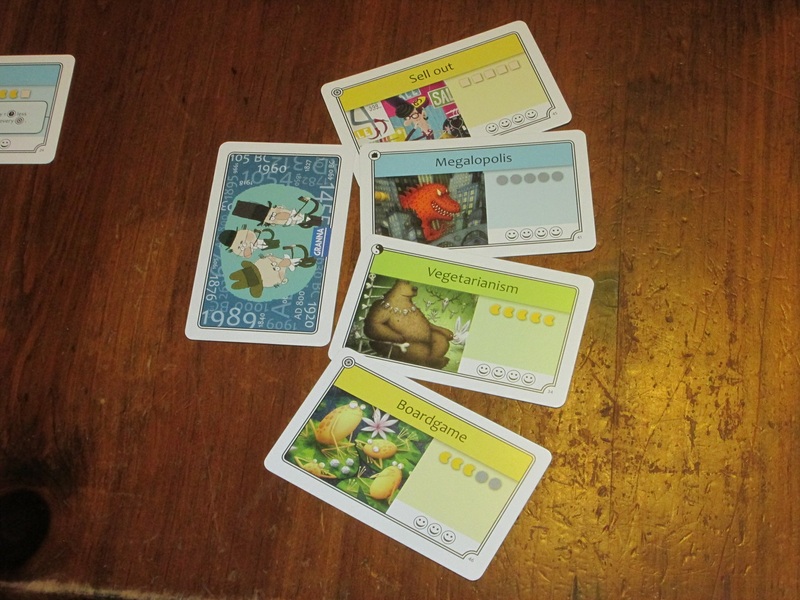 The cards are long and lean and have plenty of space for displaying the illustrations. 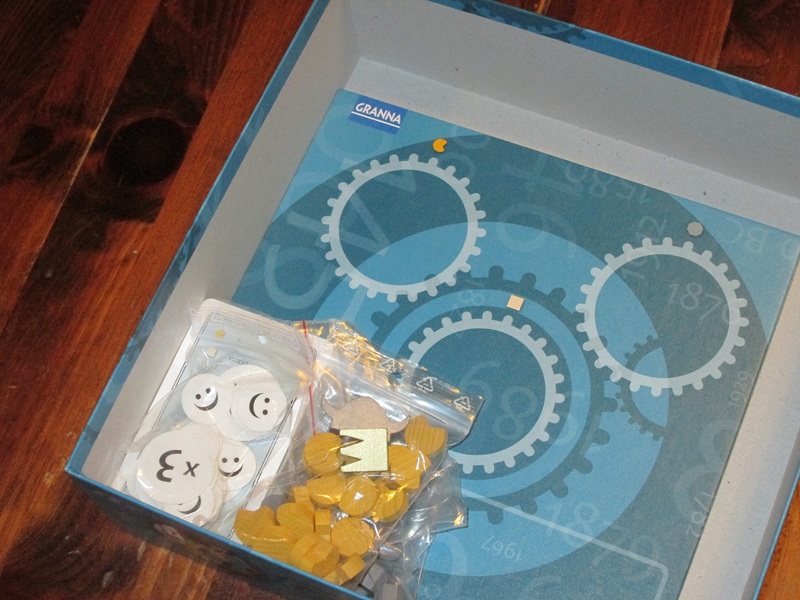 The board is a bit superfluous, but it is a handy way to keep the game organized. The game comes with just two player aids, which I was initially upset about (why not one for each player? ), but in actual practice, this is fine–you really don’t need more. It’s easy enough to set the two aids in the center of the table to provide a brief reminder when you need it. 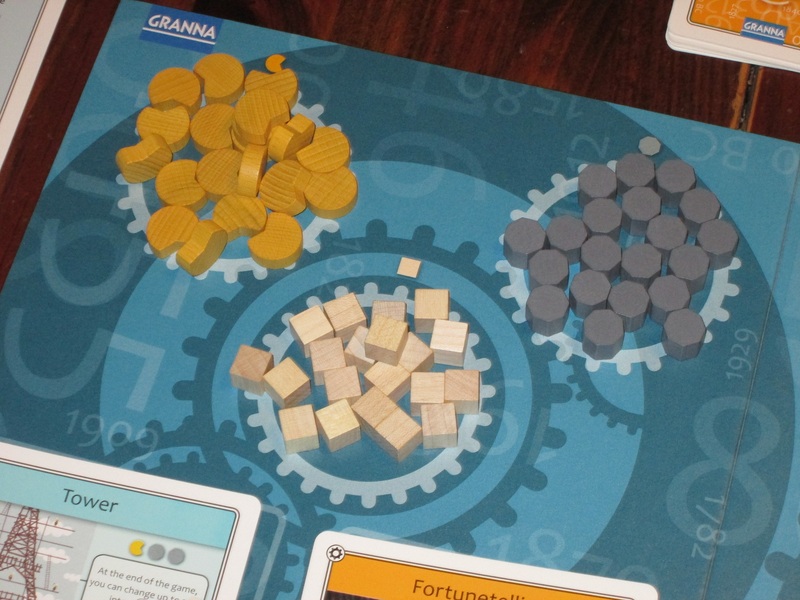 The happiness tokens are very thin cardboard, but this isn’t a huge deal. My biggest component gripe is the size of the box, which is much, much bigger than what is merited by the slender component list. 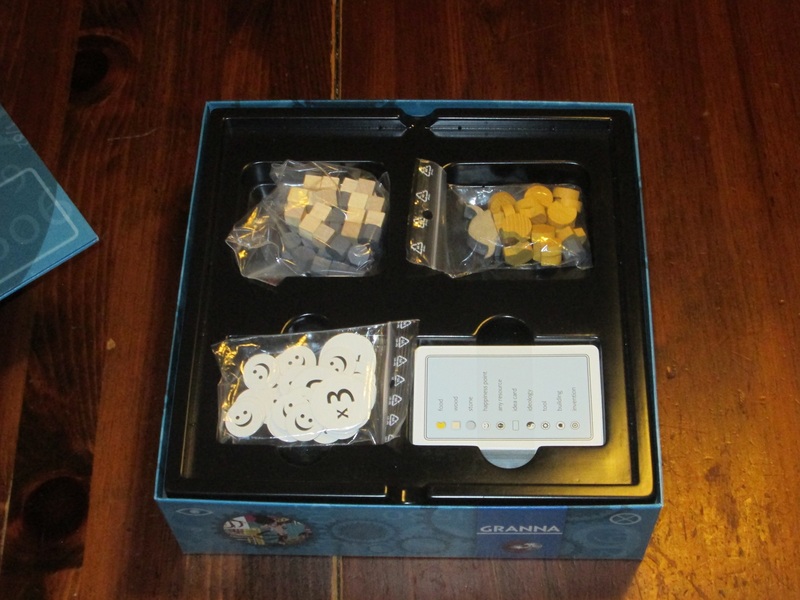 I suppose expansions for this game might be in the works and the box is bigger for the (again, unnecessary) board, but in the meantime, there is a lot of air in the box. There are two included two-player variants. I didn’t try these, but they are there. I’ve played the game with three, four, and five players, and I’ve enjoyed all counts, but I think four is the best. With three, there’s less tension in seeing who chose which role, since almost everything will succeed (although there was a time when all three of us slacked in the same round); with five, you overlap with others more often, which might make resource acquisition a little too congested. I think four is just the right combination of tension and progression. I didn’t try the game with two players, as it involves phantom players (something my wife will not tolerate), so I can’t comment on the two-player variant. CVlizations falls for me into the broad category of “solid,” a game that I’m willing to play if others suggest it, but I probably wouldn’t suggest it myself. It does what it does well, but it’s missing the spark that makes me want to play it again and again. There’s nothing I hate about it–I’m not a huge fan of stealing resources or the illustrations, but I’ll tolerate both–yet there’s also not much that I love about it. I won’t groan about it when it’s suggested, and I’ll enjoy every play, which is more than I can say about a lot of games. And my tepid opinion on CVlizations doesn’t mean it’s not a game worth owning. I think all of us have plenty of “solid” games in our collection, games that aren’t likely to light the world on fire but that for one reason or another we keep because we prefer them to other equally solid games. 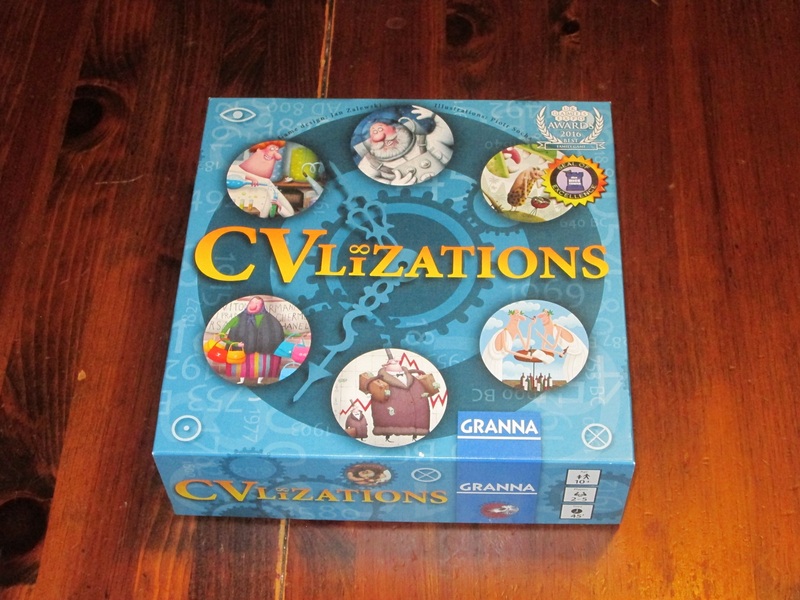 CVlizations has a lot going for it on this score–if you like the illustrations, or the civ-lite theme, or the central mechanism of trying to cooperate but only so much, the rest of the game is well done, and I don’t think you’ll regret picking this up. For me, I’d usually rather play something else. iSlaytheDragon would like to thank Passport Games for providing us with a copy of CVlizations for review.